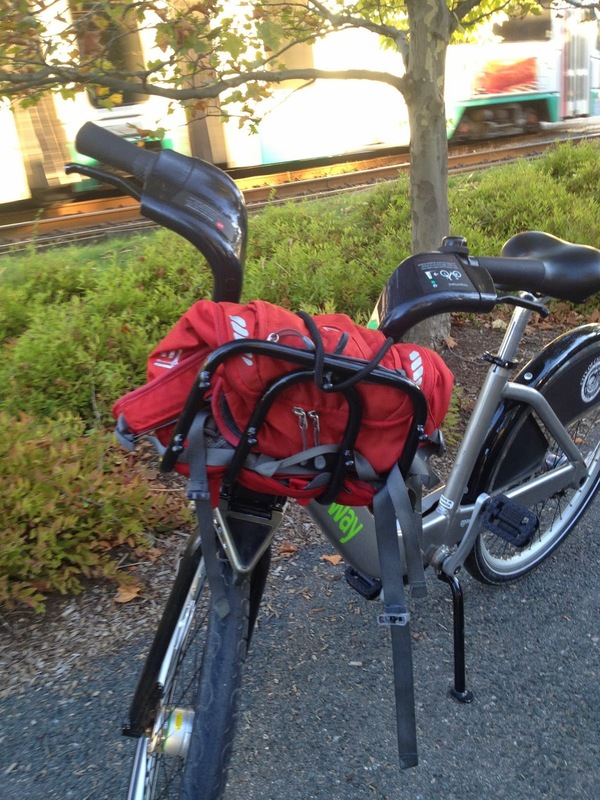 A business trip provides a chance to experience a new city's bike culture. Prior to printing my boarding pass for a quick visit to Boston, I went online to check out the opportunity to do some bike riding. I was delighted to see that Boston was celebrating the two-year anniversary of its bike share system: Hubway. Even more delightful was the discovery that a docking station was located across the street from my Brookline hotel at Coolidge Corner. I had hoped I'd be able to bike from my hotel to my meeting at Boston College, but alas, I was near the western edge of the Hubway system and there would be no place to return the bike. So my plan was to get up early and just go for a little neighborhood jaunt. Although DC has the nation's premier bike share program, I confess I have yet to use a Capitol Bikeshare, or CaBi. After all, I have a bike...why pay to use a heavy tank, I figured. 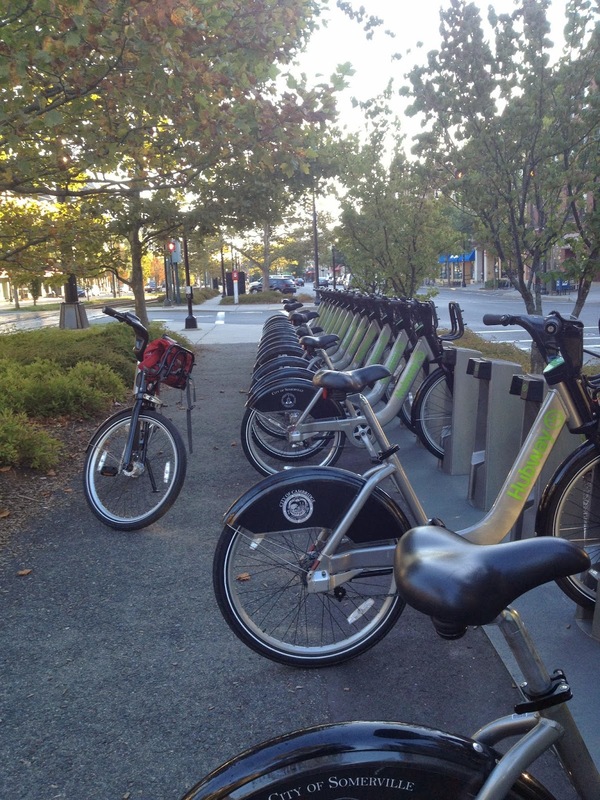 So my navigation of the Hubway bike share system was a first...and proved to be simple. It was a perfect, cool, sunny morning for a ride. The station was fully stocked with bikes at 7 a.m. and I eyeballed the bikes, successfully selecting one that had the seat adjusted just right for my short legs. Yes, the 3-speed bike was heavy as a tank, but I was pleasantly surprised at how easily it rode, even going up hills. For the most part, I stayed in 3rd gear, downshifting only to 2nd on modest hills. That said, I managed to avoid some of the very steep up hills in the neighborhood. I did, however, go down one enormous hill - a bit nervous about how well the bike's brakes would function. Needless to say, I'm still alive, though the brakes could have been a bit tighter. The bungee-corded basket held my backpack securely. The easy step-through design, seat, and handlebar placement were all quite comfy. All in all - I quickly became a bike share booster. I didn't plan a route, preferring to just meander around the area, feeling like a kid out exploring. Side streets had little traffic in the early morning, and major streets all had bike lanes or sharrows. The Boston bike lanes are printed with regular exhortations for riders to wear helmets, "no excuses." Of course, I didn't bring a helmet with me, so I just had to be careful. I found myself in the diverse Allston neighborhood, taking note of the businesses I rode by: taquerias, tofu huts, toy stores, and tattoo parlors. There were kosher delis, a Brazilian bakery, check cashing ripoff joints, and the usual excess of coffee choices. I made note of other Hubway docking stations, because I wanted to plan ahead in the event that the one closest to my hotel was full when I returned. As evidence of the robust use of the system, when I brought my bike back (within the half hour's use that came with my $6 rental fee) "my" slot was filled, but two other slots were open. I thought it was pretty good that between 7:00 and 7:30 a.m. at least four people had used this one station. After returning the bike, I walked to Peet's for my morning caffeine boost. A long line of people snaked around the corner and I thought, Peet's can't be that popular. Indeed, they were waiting for Verizon wireless to open, as the new iPhones were going on sale. 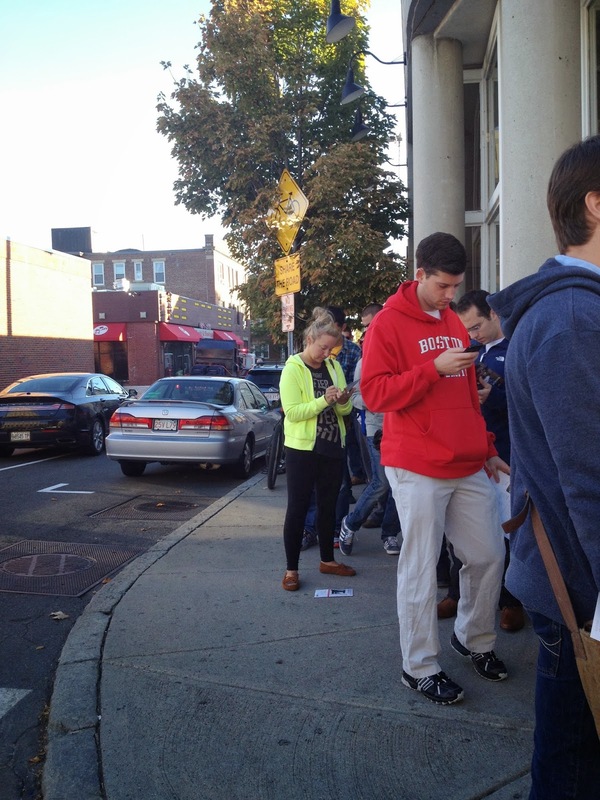 I adore my iPhone, but it astonishes me that people would wait in line for hours just to get a new one. Clearly, as the photo below shows...everyone already has a smartphone! I left Boston with a new interest in using bike share at home...if only they would expand Arlington's coverage a little farther west, as the closest station is over 2 miles from where I live. But I anticipate using the CaBi bikes for short trips around DC...or the closer-in sections of Arlington. With some time off around Labor Day, I packed my bike in the back of a $137/week (including tax!!) rental car and headed out for a Taoist weekend in Yogaville. It was a spur-of-the moment decision. I had wanted to go to my usual “spiritual home” – the Himalayan Institute in Honesdale, PA. But I’d hoped to share the 5-hour drive with my friend Gayle. Gayle is hard in training for the New York to DC Climate Ride in three weeks and didn’t feel she could take the time off from her rigorous schedule. As a side note – Gayle is 65 years old and has been doing 60, 70, even 90 mile bike rides to get in shape – so, GO GAYLE!! But I couldn’t face the long drive alone and decided to go to Yogaville instead – a much shorter 3-hour trip. I arrived a day early, getting there in plenty of time for a pre-dinner yoga class. The next morning – after another yoga class – I was determined to spend the morning writing. I’d lost all the edits I’d done while in Minnesota and, well, let’s just say it hasn’t been a highly productive summer for writing. But I was distracted by mournful howls penetrating the stillness of my room. I peeked out and saw that, across the way, a lonely French Bulldog was parked in the window of another room, wailing for its human companion. I went over and talked to her through the window, reassuring her that someone would be back soon. It seemed to calm her down and I was able to complete the edits on one essay. I then took a laughing yoga class, which definitely cheered me up, went for a post-lunch bike ride, and had a massage – not a bad way to spend a day. As I left my room the next day, the little Bulldog came running over to me (the door to her room was open). I don’t think it’s anthropomorphism when I say she wanted to thank me for my visit the previous day. Her gratitude was so great that, when I started walking to lunch, she insisted on following me. I went back to the room and found her owner – letting her know that Naima (I’d read her nametag) was about to take off with me. The rest of my stay at Yogaville was filled with learning some of the lovely practices from the NI family style of Qi Gong: the Dao-IN and The Eight Treasures, as taught by Paul Olko. After eyeing each other throughout the 4-day workshop, another participant and I finally realized that we had known each other through mutual yoga buddies many years ago and we had a good time catching up on old friends and memories. As a counterpoint to the quiet Qi Gong sessions, each afternoon I took a bike ride in the sweltering heat. What a joy to ride on gently rolling country roads with hardly a car – even though the heat wore me out. On Sunday afternoon Naima was outside again and, as I went over to pet her, her owner asked if I was from New York, and did people tell me all the time that I looked just like Jane Goldberg? I’m not from New York, and I don’t look like Jane Goldberg – but I do know that she’s an awesome tap dancer because Sarah, one of my oldest friends, used to dance with her in New York. As we started connecting the dots, it turned out that Naima’s human was Connie – a good friend of Sarah’s. The two of them had performed as The Doily Sisters at La Mama in New York more than 30 years ago. What a small world it turned out to be. 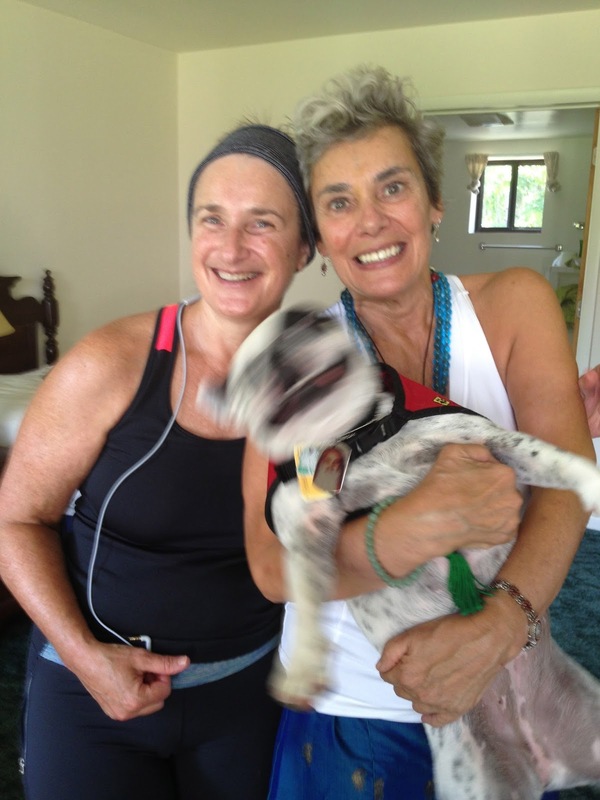 Connie was at Yogaville for a different program and we never would have connected, had not dear little Naima brought us together. We only had a short time to talk, but Connie and I were delighted to find each other. It seemed the hand of fate guided me to Yogaville.